Jethro Buck’s exhibition “Freefall,” presented by Jenny Blyth Fine Art, is the latest collection of work currently being shown at Oxford’s Art Jericho gallery. Consisting of around thirty pieces executed in the style of classical Indian miniature painting, Buck, who is currently a graduate student at the Prince’s School of Traditional Arts in London, blends traditional Eastern influences with a contemporary narrative to create a unique and compelling body of work. These various influences are clearly evident in Buck’s diverse collection. Inspired largely by traditional Indian and Persian culture and the sights and sounds he encountered while venturing through India’s vibrant streets, Buck’s traditional method of craftsmanship is seamlessly juxtaposed with his modern sensibility. 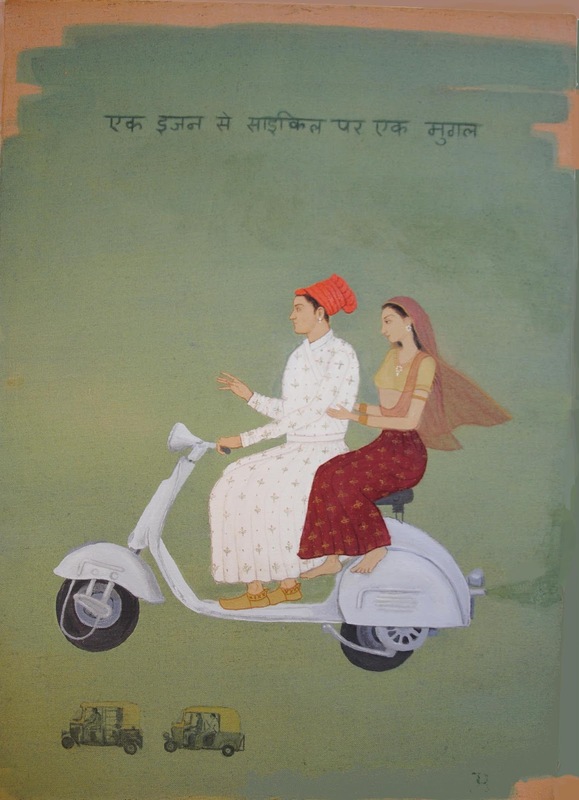 This is particularly noticeable in Mughal on a Vespa, an oil on linen work that is based on an 18th century painting of a Mughal emperor riding a horse. 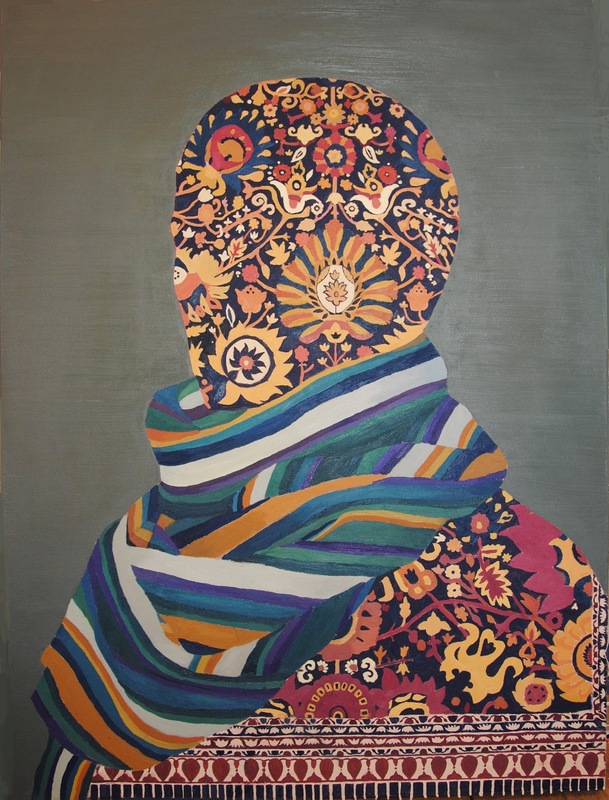 Aside from such clear depictions of modernity, the twenty-seven-year-old Buck’s contemporary perspective helps to keep the work fresh and dynamic despite the deeply traditional roots of his chosen technique. Buck’s choice of materials is as varied as his subject matter, as he sets a combination of hand-mixed gouache, walnut ink, oil paint, shell gold and acrylics on a variety of bases including watercolour paper, canvas, tea- stained antique paper and Wasli, a type of handmade paper devised in 10th century India and used specifically for painting miniatures. Buck’s colour palette ranges from vibrant and bold hues to more subdued tones reminiscent of decorative porcelain vases. According to Jenny Blyth, “Jethro learned the traditional methods for preparing pigments where minerals such as Malachite, Cinnabar and Lapis Lazuli are ground to a powder and bound with Gum Arabic, and how to make a perfect brush from the hairs on a squirrel’s tail.” Buck’s workmanship is fine, detailed and imaginative, especially in his depictions of mosaic-like Persian carpets and tapestry. It is intricate and incredibly precise without compromising the liberating quality of the collection’s overall narrative. 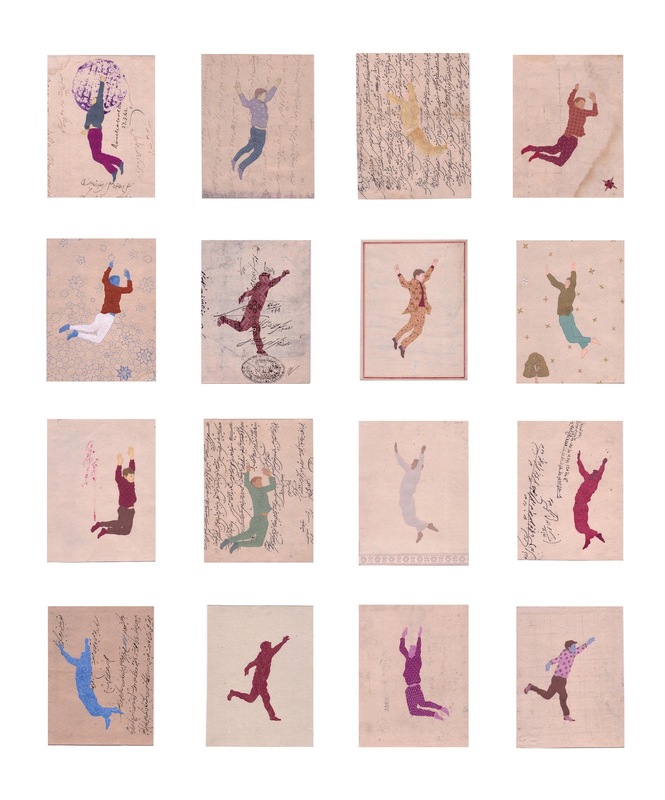 Buck’s Jump series, consisting of fifteen paintings set on handmade paper with elaborate Hindi text, epitomises the sense of freedom that is present throughout the entire collection. Working in collaboration with Vinita Sharma, each of the paintings consists of a single figure in various stages of jumping or free falling, seemingly defying all laws of gravity. Inspired by Buck’s observations of young boys launching themselves into the lakes of Udaipur, the pieces communicate a sense of reckless abandon while also functioning as series of self-portraits of Buck himself. Here, traditional Hindi script is married with the dynamism of youth, as Buck draws on the emotions associated with his trips to India and his personal plunge into unfamiliar territory. It is this sense of wonder and discovery that characterises Buck’s work, providing it with a compelling personal narrative that reinforces the beauty of his fine craftsmanship. The paintings which poignantly illuminate Buck’s voyages to India are a fascinating account of his immersion in an artistic tradition that he more than does justice to in this collection. Jenny Blyth Fine Art in conjunction with Art Jericho presents Freefall: An Exhibition of New Paintings by Jethro Buck. The exhibition runs from the 21st of March to the 27th of April at Art Jericho and admission is free. For more information, visit Art Jericho’s website or the artist’s own page.